This was something that I'd bookmarked from Indira's Mahanandi almost 2 years back. I finally made it for for Vaishali's Sweet Vegan event earlier last week. However, I never got around to actually posting it before the deadline! Roast the rava in a pan till it changes color slightly and turns fragrant. Line the inside of a tray/pan (I used an 8 x 8 inch baking dish) with some foil and set aside. Take a large saucepan, add the mango pulp and cook on medium heat. Add the sliced almonds and cardamom powder and stir in the roasted rava. 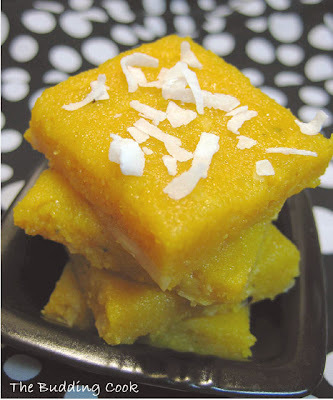 Cook the semolina/rava in the sweetened mango pulp. Mix well and keep stirring till the mixture thickens and comes together. Turn off the heat. Transfer the mixture to a tray/pan and spread as evenly as possible. Top with coconut flakes. Allow it to cool. Chill for 6-8 hours. (I refrigerated it overnight because it was very soft and sticky even after chilling for a while.) Cut into squares. Serve. The burfis were a little too sweet and soft for me. I'll add a little less sugar and a little more semolina/rava the next time around. This is my entry for Zlamushka’s Tried and Tasted which features Mahanandi this month. I am also sending this across to Aparna for Sweet Celebrations. This also goes to Susan who is hosting the November edition of Sugar High Fridays. So tell me what kind of rawa did you use: fine or coarse? Or does it not matter. Beautiful colours and that burfi looks super delicious.? That looks like a sunny, sweet reminder of summer :) Pretty and am sure it tasted delicious too. did u use canned mango pulp? Looks amazing..Guess it just melted in the mouth.. This looks lovely. I love anything with mangoes in it. And I was wondering where you got the mango at this time of the year! ..here after a long while..got a looot to catch up with your fantastic posts!.. great job.. looks very nice. first time here. This is so tropical. Looks good. Will try it soon. Mango is my all time fav... YUM! irrestible mangoes!! they do not look too difficult to make either. Oh my god, TBC, that is incredibly gorgeous! I love that bright orange color. I am trying this asap! Aparna- Me too! I really miss the mango season in India. There is absolutely no comparison between the ones we get here and the ones found back home. Bharathy! How have u been? Where did u disappear? Hope you are doing well. Mahimaa- thanks! :D Hope to see you around. Glad you liked the brownies too. This sounds great I love mangos!! u are on a sweet kick!! luscious looking burfi. How were the b-day celebrations? They were gone in no time at all. I was wondering how Latha was doing. It's been so long since I saw her post. Wow! Beautiful photo. Looks so delicious! I like the sound of mango flavoured semolina. Mmmm, can almost taste this one, looks that good!!! :) How u been T? I was off vacationing in India, got back last week. the burfis look so good and heavenly, never heard of mango burfis!! The burfi looks amazing!! I just made something similar with pumpkin, but mango..yummm. 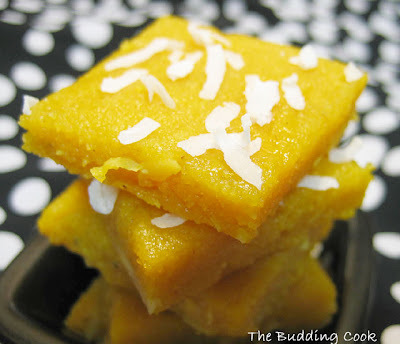 You have no idea how I adore mango....and burfi? You must strap me down to restrain me from scooping up more squares than are my share. Thank you for the lovely, fruity offering for SHF! These burfis look so good TBC. Actually I came here for the recipe for cornmeal dosai and this picture made me stay here itself. Will be back with the dosai feedback in the evening. I've sent you a mail to your gmail ID TBC. I just wanted to make sure that it doesn't go the junk mail. Nachiketa- Thanks, glad you like it! Just made this one. turned out great an yummy too. I feel like to grease the tray before pouring mango burfi. Thanks for easy and handy recipe.